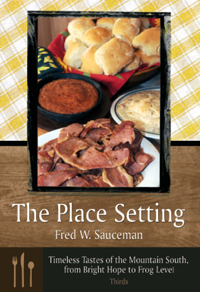 In the third and final volume of the series, The Place Setting: Timeless Tastes of the Mountain South, Fred Sauceman continues his exploration of Appalachian foodways. The book’s geographical reach extends from the land of pepperoni rolls, created by Italian bakeries for coal miners in northern West Virginia, to downtown Chattanooga, Tennessee, where the Zarzour family, originally from the Middle East, has operated a Southern butter-bean-turnip-green diner since 1918. In Clinton, Tennessee, drugstore pimento cheese leads to a lesson in the history of civil rights and equal access to education. On Main Street in Blowing Rock, North Carolina, ham biscuits hold out against the pressures of multimillion-dollar development. Sauceman takes readers inside a church kitchen in Jonesborough, Tennessee’s oldest town, where roll aroma distracts the congregation, and to the banks of a farm pond near the Nolichucky River as former tobacco growers harvest Malaysian shrimp in September. In the “Atomic City” of Oak Ridge, Tennessee, we learn how good schools led to good pizza. In the mountains of North Carolina, Virginia, and Tennessee, we delve into red hot-dog devotion. This volume of The Place Setting unlocks the secret of brown salt, traces the history of an “energy drink” that had to be rationed after its introduction in 1949, and instructs readers on ironing a sandwich.